As usual, I’m continuing to play with the format of these updates. I’m thinking now that I’ll try to do one twice per month, each one covering one Council Meeting, whatever work sessions and other meetings have not been covered yet, and any special events that I attended. That’s the plan until next month, anyway. This recap will cover the Work Sessions on May 14, 19, 20 and 28, the council meeting on May 19, the Arbor Day celebration on May 13, and the city bus tour on May 21. 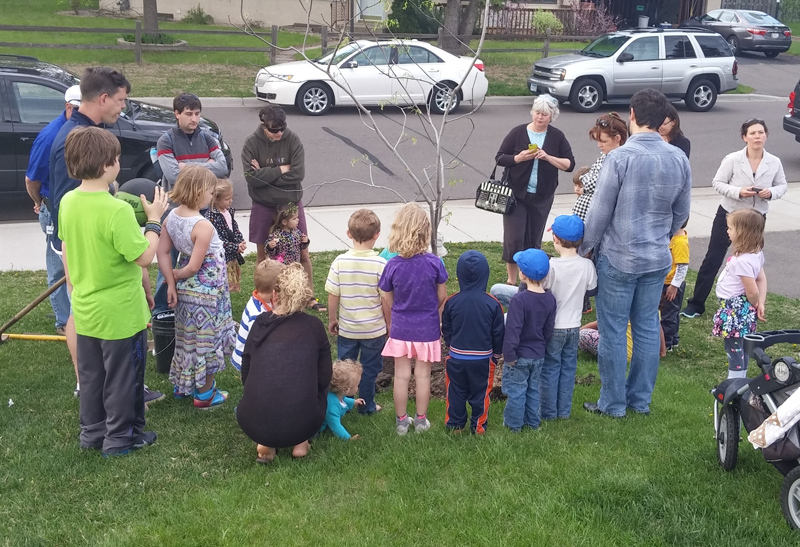 The city held its annual Arbor Day celebration on May 13 at Forest Park, which is right next to Forest School. During the summer, the Parks Commission holds their meetings outside at various parks and invites neighbors to join them. These community meetings are a great opportunity to hear from residents in an informal setting. The night started with a cleanup of the park by volunteers, then Mayor Adams and I grilled up some hot dogs, we planted a tree in the park, and then the parks commission held their community meeting. Every other year or so the city holds a bus tour where the council, our legislators, some guests from New Hope, and members of our commissions are invited to attend. The bus goes around the city and staff highlights current projects that are going on in the area, like street reconstructions, sewage pump replacements and playground equipment upgrades. It’s safe to say the new playground equipment at Bassett Creek was a bigger hit with the crowd than the new sewage pump at pump station 2, but the latter is still quite important. The bus tour is a great opportunity to go and see the projects we have been discussing, and it was a valuable experience. Funds and Fund Sources – As part of the preliminary budget discussions the council received an overview of the various funds in the city, what the balance of each fund is, and how the fund is replenished. Traffic Symposium – We discussed plans for the Traffic Symposium we want to hold this fall. During campaign season, I heard quite a few concerns about traffic- stop signs wanted, speeding through neighborhoods, etc. and so did the other two new council members. So as part of our Citizens Connection Initiative we proposed an effort to address traffic concerns in the city in a holistic way rather than a piecemeal way. More to come on this event as we get closer to the fall. Street Parking – Another hot topic from campaign season. I pledged to several residents that if I was elected I would bring up the topic of on-street overnight parking. Many residents, especially in the Lee Park neighborhood expressed a desire to repeal the ban on overnight street parking. We discussed this topic and came up with 3 potential approaches and will be seeking input on the 3 plans in the next few weeks. The item will likely be on a council meeting agenda coming up so we can gather feedback before making a decision. Commissions – We discussed commissions again, and outlined a proposal for some changes. We’re working on creating a document that details the changes, and will be putting that out for feedback soon. Blue Line Planning – A few weeks ago the Blue Line team presented to us at a work session, and the council raised several concerns about the proposed station design and placement, along with the impact on traffic. The team addressed us again on May 14 with some updates. I remain concerned about the traffic impact from the Blue Line, and think that running the train at street level is unacceptable. In addition I don’t feel it is possible to accurately predict traffic patterns 25 years in the future, nor do I think the computer models that are used to “prove” how slick traffic will be are realistic. What I do know is that in the short to medium term this project, if built, would have a massive negative effect on our city by bringing increased noise, dust, and delays from construction. I remain unconvinced that the long term benefit would be worth the pain, and of course the massive cost to taxpayers. That being said, if the project gets built anyway, we need to make sure it’s done right and that corners aren’t cut in an effort to artificially make the total cost look better. Code Review Task Force – The council recently solicited applications for a Code Review Task Force that would look at our city code and suggest ordinances to repeal, replace, or simplify. We had initially thought the task force would be about 10 people, but we received 14 applications and everyone was so good that we decided to increase the size to accommodate everyone. I was extremely impressed with the group of applicants we got, and I am excited to see what they do once the task force gets up and running later this year. Housekeeping – The majority of agenda items were what I’d call “housekeeping” items- renewing our contract with the Hennepin County Assessor’s office, approving the next steps in the alley and street reconstruction projects, and some miscellaneous budgeted items for the public works facility. Water Fee Increase – The big item on the agenda was the approval of an increase to the water rates to pay for the replacement of the broken water main. As I covered before, the water main failed much sooner than expected, and needed to be replaced. This is the pipe that caused sinkholes in Robbinsdale twice over the last few years. In order to pay for the replacement we needed to come up with Crystal’s share of the cost. It was originally estimated to be $1.6 million, but the bid came in at $1.2 million. That led to a discussion of whether we should approve a lower rate increase (like 70 cents per 1000 gallons) or keep with the $1 per 1,000 gallons we had planned. The rate increase will generate additional revenue to cover the cost of the repair, but it will take several years to generate the whole $1.2 million. In the meantime we have to cover the cost of the whole repair up front using other city funds. That’s OK- we do have the liquidity to make that work, but ultimately the whole $1.2 million will have to be generated. It was my preference that we kept with the $1 per 1,000 gallon increase so that the repayment window was as short as possible. The 70 cent plan would have lowered the average water bill by about $1 per month, but lengthened the repayment window. I believe that the rate we put into effect was the most responsible decision for the city’s financial health, and puts us in a good position in the future without an undue burden on our residents. One feature of the rate increase plan was that we would freeze the rates at their new amount for a period of two years- giving everyone a break from future increases for a while. The new rate structure passed on a 6-1 vote, with Mayor Adams dissenting. The next council meeting is June 2. The Crystal City Council had two work sessions, a Council Meeting, an EDA meeting, and a bus tour sponsored by the Parks Commission during May 2015 week 2 (week beginning May 3). Charter Commission – The council met with three candidates for an open position on the city’s Charter Commission. The Charter Commission reviews potential changes to the city’s charter, which can kind of be thought of as the Constitution for the city. There were three applicants- two former council members, and a third who is currently a member of the Parks Commission. This commission is unique, in that the council doesn’t select the members, but instead the selection is done by a judge. The council still likes to meet with the applicants to learn a bit more about them and thank them for applying. We were informed earlier this week that the judge had selected Nancy LaRoche (the aforementioned Parks Commissioner) as the new Charter Commissioner, so congratulations to Nancy. Per the request of several council members, we received a primer on the differences of public right-of-way, boulevards, easement, and private property. This issue has surfaced several times since I have taken office, primarily as a question about trees located in the boulevard- who is responsible to take care of trees located in your front yard, but not exactly on your private property? Why do some residents find new trees planted in their yard without their consent? This issue is also at play with the planned Three Rivers Park District bike project. Many people, myself included, are unsure exactly where their private property line is drawn. The city and county are able to use a part of your front yard for their purpose, and this arrangement can be unwelcome and distressing to many residents. Boulevards and Public Right of Way are city property, and are reserved for city and public use. Boulevard is generally the area between your property line and the curb, and Right of Way is the entire street (and sidewalk area). Residents do not pay taxes on the this piece of land, but are responsible for the Boulevard’s upkeep (mowing the grass, shoveling, etc). This topic can be quite confusing, so if you have any questions, let me know. Boulevard Trees - We also briefly discussed trees that are located in the boulevard- so technically on city property, but for all intents and purposes in your front yard. This has been a hot topic of conversation, as Olga mentioned above. Our city staff, led by our new City Engineer, is working on a proposal to clarify the polices related to boulevard trees, so more to come on that. Water Main Repair Financing - I covered this about a month ago, but Crystal has to come up with an unplanned $1.5 million to repair the water main that runs under Robbinsdale. This is the pipe that has broken twice in two years and created sinkholes in our neighboring city. Several options were proposed, but the option that seemed to be preferred was a rate increase of $1 per 1000 gallons of water used to go into effect immediately, and then freezing water rates for 2 years. We’ll be covering the upfront cost by moving some money from the sewer fund to the water fund, and then gradually paying back the funds over the next few years. We looked at about 15 different proposals, and this one was the only one that didn’t put undue strain on the water fund. I also like the certainty of knowing that rates will stay steady for the next few years. We’ll be voting on the final plan to make it official at the next meeting. Commissions - The council is continuing our ongoing conversations about city commissions. The conversation will continue in about 2 weeks. I would like to stress that no decisions have been made on anything, and that I am seeking feedback from anyone with an opinion on the topic. 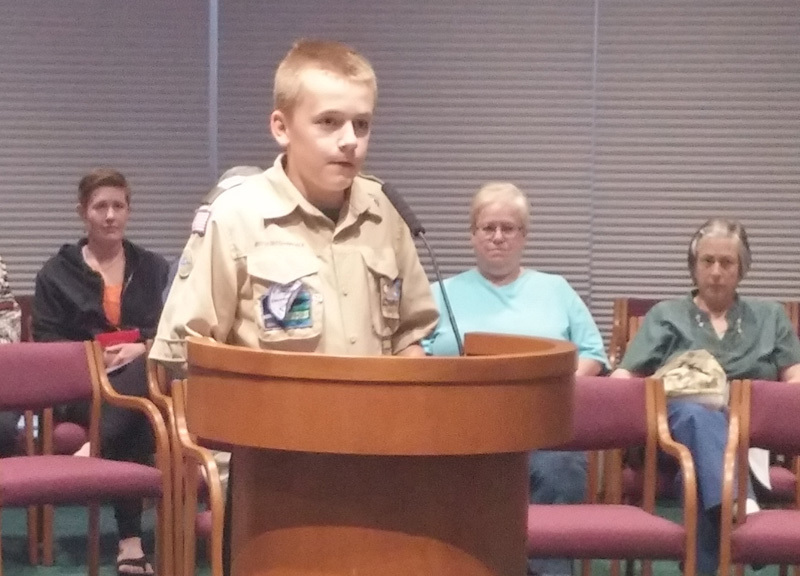 Pledge of Allegiance – I was contacted by Brian Lindahl, a Boy Scout who lives in Ward 2 and is working on a merit badge that requires him to discuss a current issue with an elected official. We discussed the proposed rail connection prior to the meeting, and I invited him to lead us in the Pledge of Allegiance, which he skillfully did. Police Awards – Police Chief Stephanie Revering presented two awards- one to Officer Tim Tourville who received the MADD award for efforts to decrease drunk driving, and one to Officer Mason Barland who won the Meritorious Service Award from the MN Chiefs of Police Association. Congratulations to both! Alley Construction Project – We held the public hearing for this year’s alley reconstruction project, which is part of a long term project to reconstruct all of the alleys in the city. We heard from a few citizens during the public hearing. This project will come up for two more votes before it is complete. Three Rivers Trail – I’ll send you over to my colleague Elizabeth Dahl’s website for a recap of this, since and she did a great of summarizing what happened. Almost all of the trail will go through Ward 1, which Elizabeth represents. Only one item on the agenda- acceptance of an proposal by Novak-Flek to option a vacant lot for redevelopment. Novak-Flek has developed several lots in Crystal, and are entering into an option agreement (basically reserving the lot) to develop later. On Wednesday, May 6 I joined the Parks Commission (and my wife, who currently chairs the commission) on a bus tour of eight of our city parks. The commission is working on a long range plan for our parks, and this tour was an opportunity for them to visit the parks together and share some of their vision with members of the council. The commission has a lot of work to do to ensure that our parks continue to meet the needs of our residents well into the future. I am excited to see the long range plan they come up with. The next council meeting is May 19, and the next work session is Tomorrow (May 14).